Within the last month Google announced the released of their new web-based version of Google Earth. 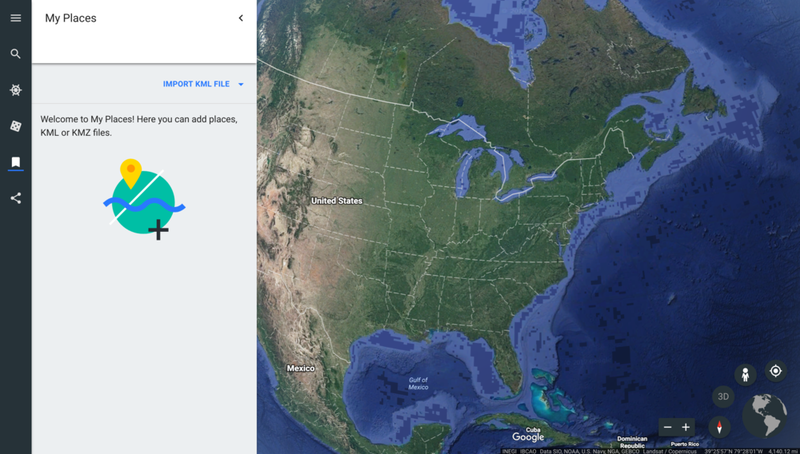 For those who have been fans for Google Earth over the years this is a big deal because let's be honest, its been years since Google Earth has come out with any serious features or overhauls. There have been minor updates but nothing that screamed that Google was focused on evolving this capability for the Geospatial community since 2011. This version helps bring to light many humanitarian worldwide issues, fascinating wonders of various world heritage sites, and shows off the potential of new capabilities exposed through a web-interface. In this article we are not going to waste time writing another review focusing on all the features in the current interface. A good walk-through can be provided by the Google Earth Blog. Instead we are going to focus on the differences between the old downloadable client and the new web-interface along with some noticeable gaps in capabilities. For more traditional users the old downloadable client is still available and worth downloading to take advantage of capabilities this new version has yet to implement. With that said lets dive into the good, the bad, and the ugly. This is the view upon initial login. This web-interface mirrors the simplicity experienced on the mobile application providing easy navigation without the complexity of deep menus. As seen below the web-interface dumbs down the traditionally earth server layers into quick toggles to turn on/off things such as borders, labels, places, and roads. A customized option is available to dive into deeper controls but its three clicks down from exposing it users face such as what the client does. From the appeal of a clean UI this positive note but can be an added frustration if you are heavy into switching between specific map layers. The overall design of the interface is attractive as it does make more use of screen realestate and organizes options in buckets if users need them giving more focus on the map once the settings are decided upon. One of the more undervalued features missing is the ability to exaggerate the terrain in certain areas of the world. This was a powerful visualization feature that helped certain areas of the world makeup for the lower resolution or lack of any in certain areas of the globe. Another area of contention is the how much is the allowed memory cache size. The maximum in the web client is 1000 MB. In the old client it is 2000 MB. Where this impacts users is the amount of data that can visualize on the map at any one time. This may also limit the size of KMLs that can be loaded as well. In the old client KML files can start to choke between 30-50k points depending on how good your machine is. A lot of what it could handle was pushed to the client-side for the workload. This brings more uncertainty towards how powerful the web-based client really is. What has historically separated Google Earth from old clients such as NASA Whirlwind and ESRI's ArcGIS Explorer (essentially rebranded ESRI Earth) has been the ability to do more than just visualize data. Users could create points and polygons creating their own packages of interesting places and annotating details for their own geographically focused projects. Even more this was built on a revolutionary geospatial format that became a community standard known as Keyhole Markup Language or KML. In the Google's new web client we lose a lot of that capability. We no longer can add individual points or polygons. The only remnant of what was and what could be is in the "My Places" section. This area allows a user to import KML files from Google Drive or upload them. However, not all KML files will work, its not clear of what the limitations of import are, and KMZs are a definite no too. Another exception is that you can search for a place using the search bar and add the individual search result items to your "My Places". Will the Web-client handle Dynamic KMLs (Network Links)? How big can my KML Files be? Can they contain points or polygons? How will they handle KML files with folder structures? On the note of importing data the new client can only import KML files. What about CSV files, GPX files, an even SHP files that the old client was able to ingest and convert? Until this functionality is resolved the web-based client is no improvement on the original but instead just a cut down visualization of data putting it on par with what many people do not like about ESRI's ArcExplorer or their new ESRI Earth product. So what about Export features? The client has some basic social capabilities to share similar to how Google Maps works. Sharing a link actually shares not only the specific map view centered at a specific coordinates but whatever items you have turned on and focused on. For example if I hit the "I'm feeling lucky" and bring up an interesting place you can share that place along with the geographical viewpoint its centered on. Beyond that there no export functions such as export to KML/KMZ or customize dynamic KML feeds that you might expect would be perfect for the web client to act as a feed generator as well to share with others. For now the new Google Earth web-client is a great demonstration of how simple Google Earth can evolve towards over time. Its very powerful to use as a simple visualization application but overall Google has a lot of work to do if this has the purpose of completely replacing its predecessor. We all hope it grows to do just that and live up to the dream of a larger community where Google Earth has received over 12 years of loyalty had creative application proving GIS can not only be fun but prove it is possible to apply simplicity to a traditionally complex geospatial industry.